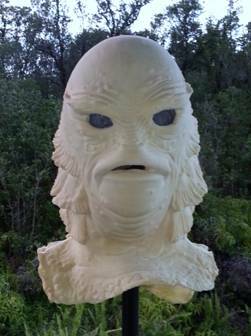 "RICOU BROWNING is widely recognized for his underwater work as the Creature from the Black Lagoon. 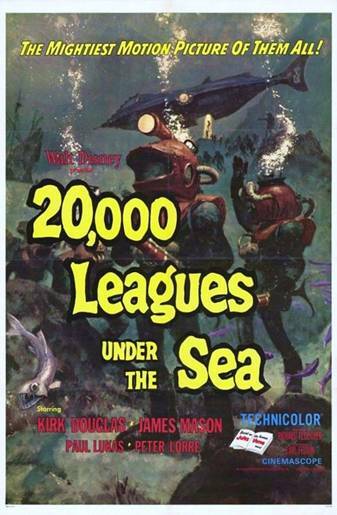 What's not as well known is he is also one of the Disney Stunt Divers who portrayed Captain Nemo's Crew in the underwater scenes for 20,000 Leagues Under the Sea. And that's only part of this man's amazing life story. 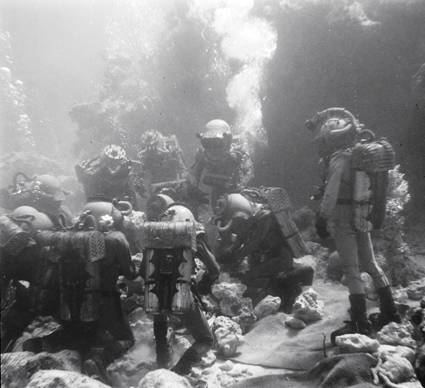 We here at Vulcania Submarine are honored to have Mr. Browning's support in producing this page saluting him as one of the original Disney Divers, and documenting his numerous accomplishments in motion pictures and television for the enjoyment of Leaguers, Divers, and Sci Fi fans everywhere. Thank you, Ricou. In a World where the term 'living legend' has become a shopworn cliché; you are the real thing. Happy to have you aboard, Sir." 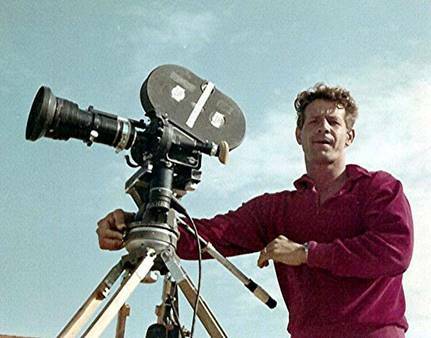 Born November 23, 1930 in Fort Pierce, Florida; RICOU BROWNING is an accomplished motion picture and television Producer, Director, Actor, Screenwriter, Underwater Cinematographer, and Stuntman. His career began when, as a teen, he became a springboard diver in Jensen Beach water shows. 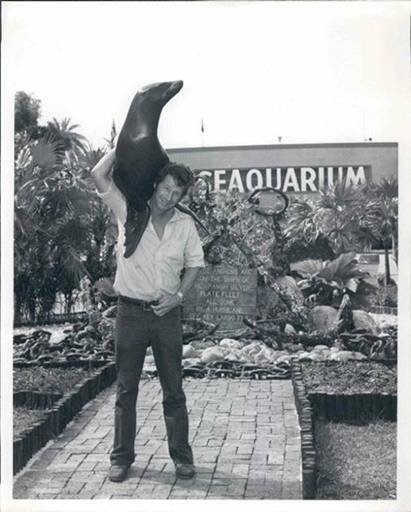 By his early 20's he was producing aquatic shows at the famous Weekiwachee Springs and Rainbow Springs, among others. 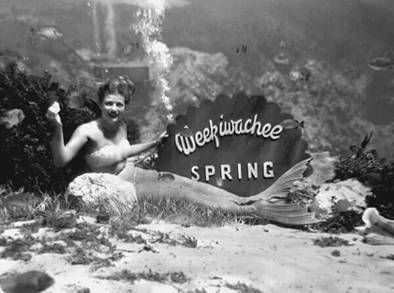 One of the World-famous Weekiwachee mermaids. 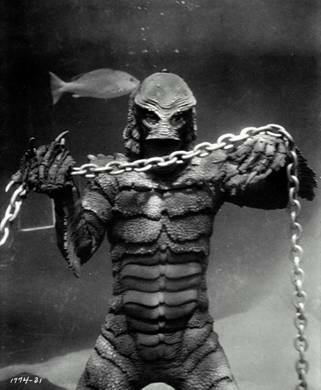 In 1953, Ricou was chosen to be the stunt diver portraying the monster in the underwater scenes for Creature from the Black Lagoon (1954). 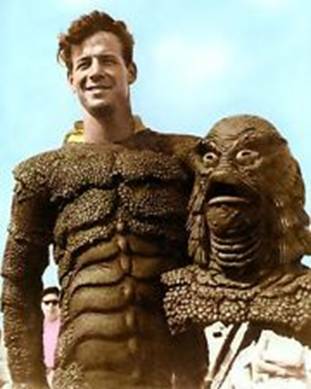 He went on to reprise the role in both sequels: Revenge of the Creature (1955) and The Creature Walks Among Us (1956). 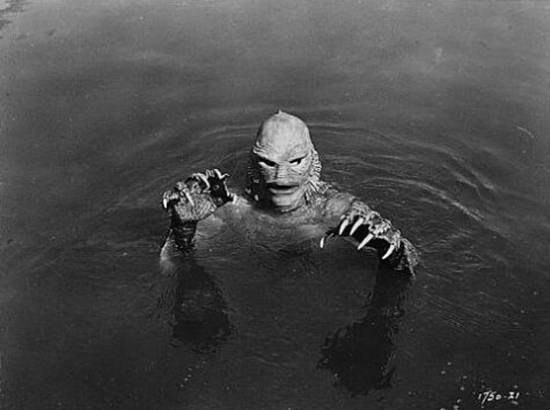 Production photo of Ricou as the Creature, 1953. 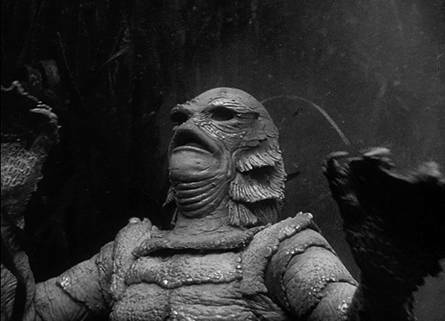 FROM WIKIPEDIA: "Creature from the Black Lagoon is a 1954 American black and white 3D monster horror film from Universal International, Produced by William Alland, Directed by Jack Arnold, that stars Richard Carlson, Julia Adams, Richard Denning, Antonio Moreno, and Whit Bissel. 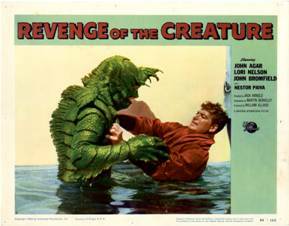 The Creature was played by Ben Chapman on land and by Ricou Browning underwater. The film premiered in Detroit on February 12, and was released on a regional basis, opening on various dates." Movie poster for CREATURE FROM THE BLACK LAGOON, 1954. 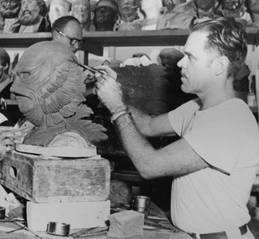 The approved design for the Creature was conceived by former Disney illustrator Millicent Patrick; though for many years Bud Westmore was given sole credit. 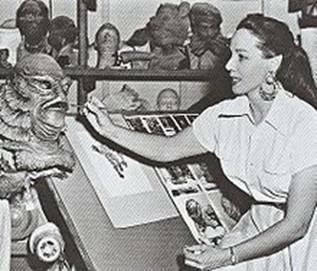 Millicent Patrick putting finishing touches on the Creature mask, 1953. 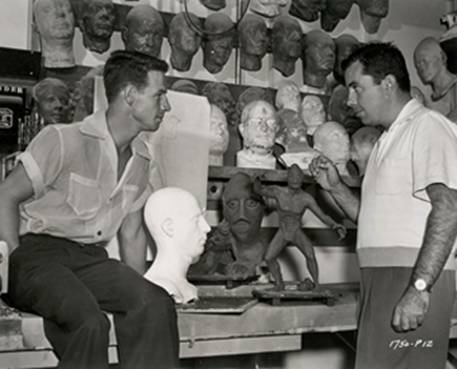 Ricou Browning and Bud Westmore, 1953. Ultimately, the suit cost approximately $15,000.00 to produce. 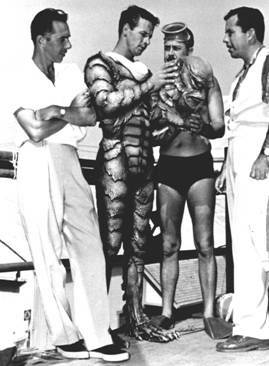 Here, Director Jack Arnold observes as Ricou becomes the Creature with the aid of (uncredited) makeup artists Jack Kevan and Bud Westmore. But let me put this into context for you: UC San Diego physicist Hugh Bradner didn't even document the wetsuit concept until 1952 and it was only shortly afterwards that Willard Bascom (Scripps Institute of Oceanography, La Jolla) suggested he use closed cell neoprene rubber. 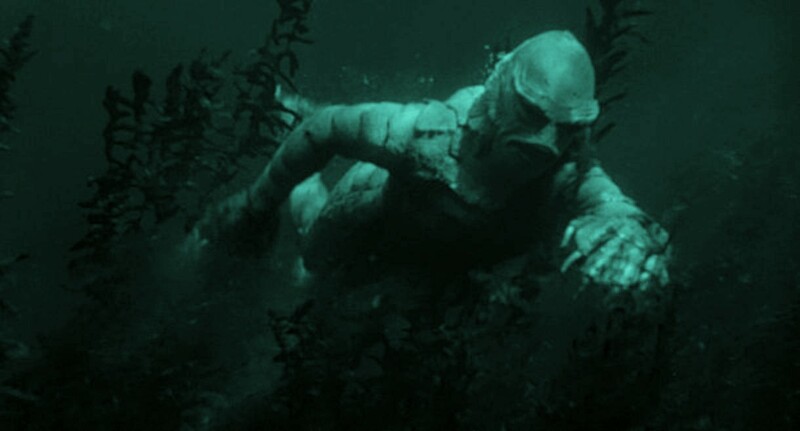 Only a few months after Jack O'Neill started making the first neoprene wetsuits in his California garage, the Moviemakers from the Black Lagoon came up with something a quantum leap ahead: THE CREATURESUIT. There was no room in the suit for any type of breathing apparatus. 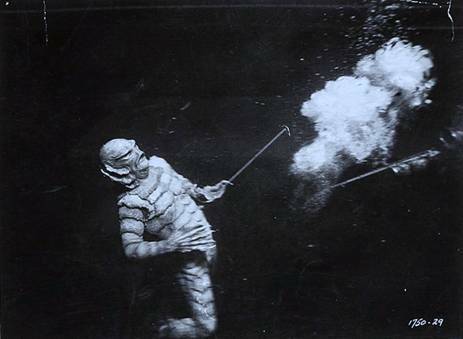 Browning received compressed air from an umbilical between takes; but when the cameras were rolling he was holding his breath the entire time until the Director signaled "Cut!" and the safety divers could get to him. "I had weights; chest plate of lead; lead around my ankles; lead-like thigh pads. I did not wear any goggles because when they filled with water I had no way to get rid of it. Vision was the hardest thing for me; blurred vision. 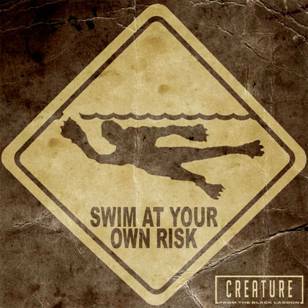 The suit was like swimming in a wet suit." The Creature mirrors Kay from below. Model Ginger Stanley performed the aquatic stunt work for actress Julia Adams. Divers have also wondered why we see Ricou making significant changes in depth, but never does the Creature do a Valsalva technique to clear his ears. 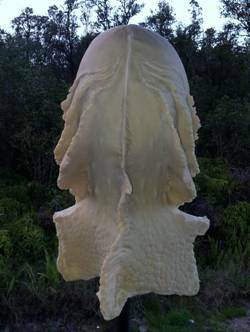 Ricou explains: "I have never had a problem clearing my ears. I moved my jaws, or pushed on the suit." 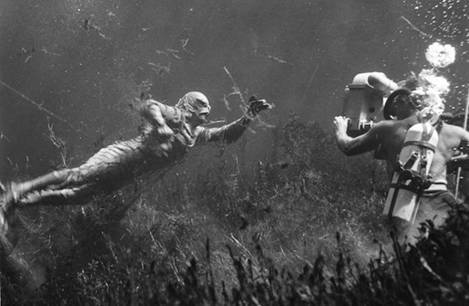 Here's another great "portrait" view of Ricou Browning underwater as the Creature from the Black Lagoon. 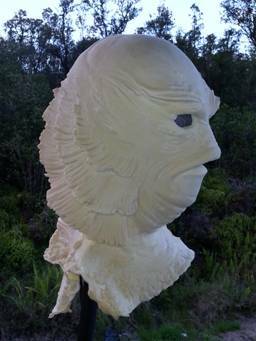 The detail and workmanship that went into handcrafting the Creaturesuit is nothing less than amazing; thus, a big part of its visual appeal and continuing popularity with fans of all ages Worldwide. 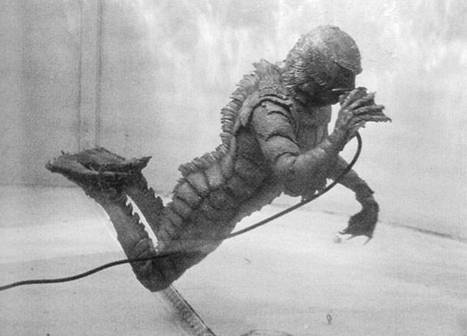 Here's one of the more iconic images of Ricou Browning as the Creature from the Black Lagoon, reproduced countless times in movie posters, lobby cards, and related artwork over the past 63 years. When something remains popular in the public consciousness that long, you know it's a work of genius. 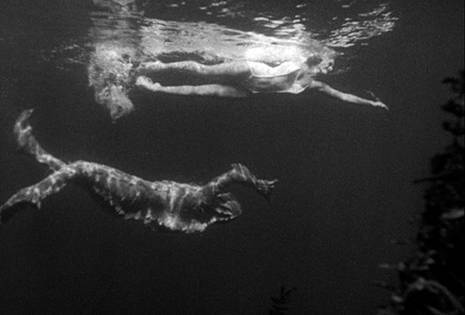 Ricou dived again in REVENGE OF THE CREATURE (1955) and THE CREATURE WALKS AMONG US (1956). He is the only actor to appear in all three movies, and today remains the sole-surviving original UNIVERSAL STUDIOS MONSTER. 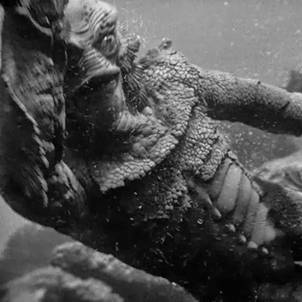 An action scene from REVENGE OF THE CREATURE, 1955. Onscreen, the Creature meets his fate when (his gills surgically removed to save his life after being horribly burned by fire) he escapes and returns to the sea; only to drown in what has now become a hostile environment. 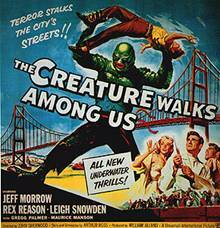 Ricou Browning in THE CREATURE WALKS AMONG US. 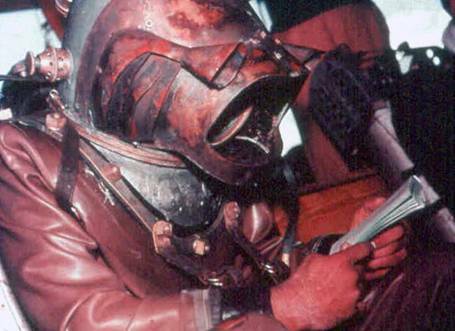 In the latter months of 1953, Ricou Browning was one of a select group of SCUBA-qualified stuntmen chosen by Divemaster Fred Zendar to operate Disney's experimental diving apparatus in filming the underwater scenes for 20,000 Leagues Under the Sea. 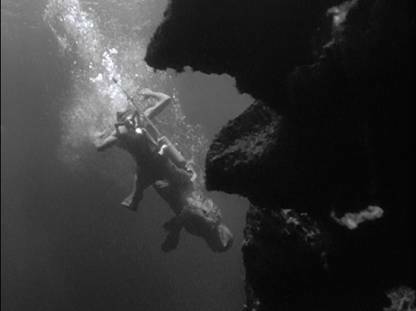 The Underwater Burial Ceremony sequence was one of the first Director Richard Fleischer filmed upon arrival in the Bahamas and Ricou was one of the eleven Stunt Divers who made it possible. All the helmets were handmade, are slightly dissimilar, and after many years of study I'm sometimes able to determine who is in which suit based on those unique characteristics. There was one Nemo, seven Crowntops, and three Baldies onscreen at the same time. 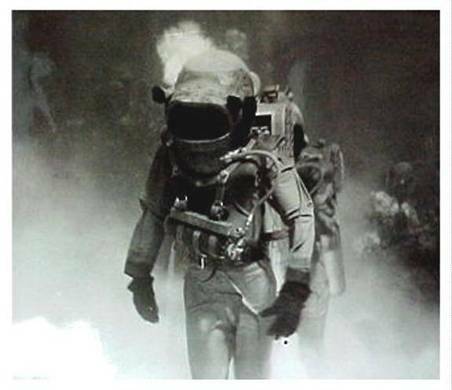 That's Dave Rochlen as Captain Nemo; Ricou is in the Baldy helmet alongside the bubble trail, approximately center in this photograph. Photo by Peter Stackpole for LIFE Magazine; published February 22, 1954. 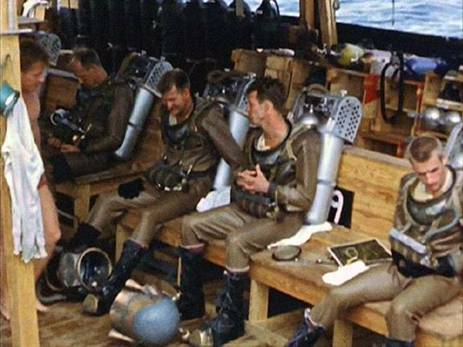 Here we see Ricou suited-up in the #9 outfitting station aboard the converted Navy LCT that served as the primary dive vessel during Operation Undersea: the filming of underwater scenes for 20,000 Leagues in the Bahamas, January through February 1954. 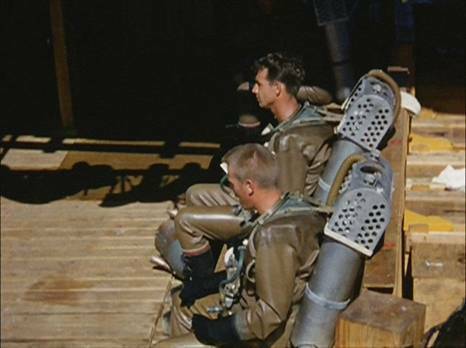 Browning is wearing the standard Crew Diver apparatus. 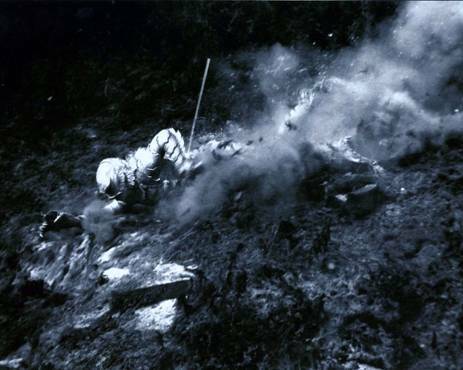 His "Baldy" helmet rests at his feet; laying on its side to avoid damaging the airtight mating surfaces of the helmet's standard "interrupted-thread" locking collar. Another camera angle on that same day, Ricou Browning and Len Mott. Ricou Browning aboard the Disney Dive Vessel. 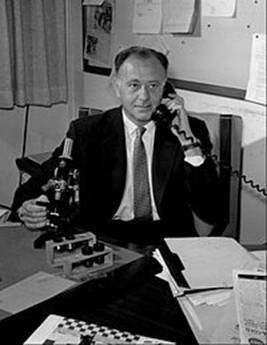 Leonard Mott in the foreground. Here's a great pic of Ricou diving the Baldy rig for the cameras. This image was later reproduced for use in lobby cards and movie posters in countries around the World. Lyford Cay, the Bahamas, January 1954. And here's one of the better color slides taken during Operation Undersea. Suited up and waiting to dive, Ricou peruses some literature to pass the time. Ricou Browning in the "Baldy" rig; the Bahamas, February 1954. 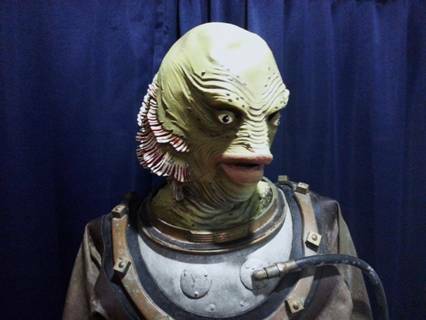 Jake D. Mannequin in costume as the Crew Diver from the Black Lagoon. 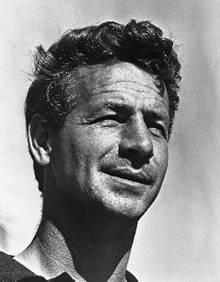 Ivan Tors was a Hungarian-born playwright who produced TV programs in the 1950's and 60's including Daktari, Gentle Ben, Men Into Space, Ripcord, Man and the Challenge, Science Fiction Theater, and more. Ricou went to work for Tors and rose to become President of his Florida-based operations. 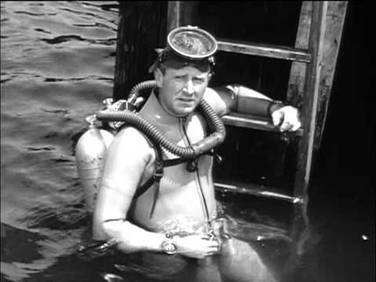 Among those programs Ricou Browning is credited with is Sea Hunt: the immensely popular TV series about frogman Mike Nelson and his underwater adventures; starring Lloyd Bridges. The show ran four seasons from 1958 through 1961 and helped popularize the growing sport of SCUBA diving for a generation of Baby Boomers like myself. 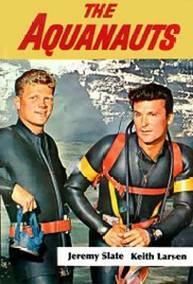 In 1960, Browning followed up with a second underwater TV series based on the adventures of two California SCUBA divers and entitled The Aquanauts; which starred Jeremy Slate, Keith Larsen, and Ron Ely. 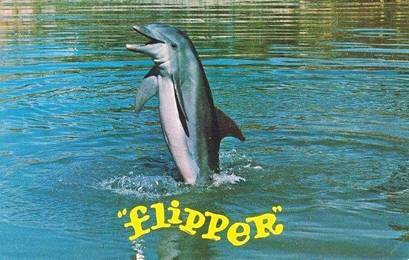 From 1964 to 1967, Browning gave us the popular series Flipper; based on his own original story idea about the adventures of a family in Florida and their pet bottlenose dolphin. 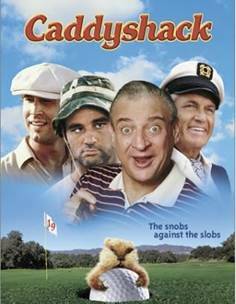 Flipper also made it to the silver screen as a full-length feature film. 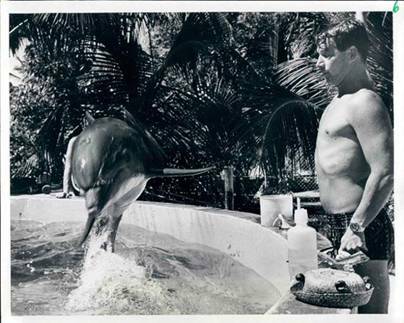 Ricou working with a dolphin while filming FLIPPER. Ricou with seal at Seaquarium. 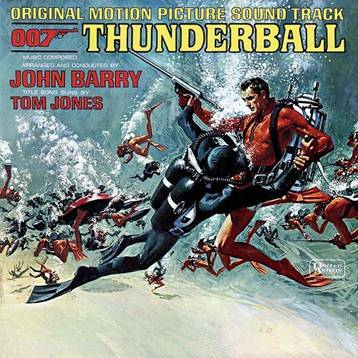 In 1966, Ricou Browning was chosen to direct the underwater scenes for Thunderball. 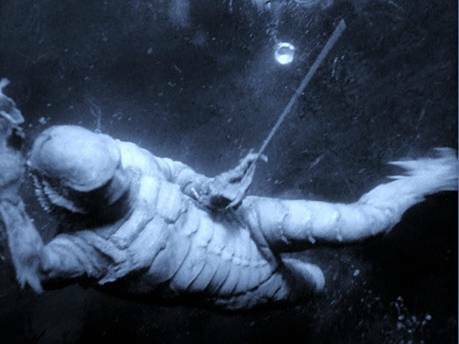 The movie won an Academy Award for what viewers came to recognize as some of the most complex and amazing underwater action sequences ever filmed for a motion picture. As a teenager, I was a big fan and had the movie soundtrack on a 33 rpm disk which I played endlessly while working on paintings of scenes from James Bond flicks; one of which netted me the Blue Ribbon in a regional High School art competition. In the image below we see some of the complex choreography that went into filming the underwater battle scenes for Thunderball. That's a LOT of stunt divers to have working before the cameras all at the same time; perhaps the most ever documented on film. In Thunderball, arch SPECTRE villain Emilio Largo leads his criminal crew on a clandestine mission using a bevy of submersible vehicles unlike anything seen before or since. It would exceed my abilities in this humble honorarium to list all of Mr. Browning's many achievements. But I hope it will summarize his career by saying that, in 2006, he was awarded Film Florida's first Florida Legends Award; and he was inducted into the Florida Artists Hall of Fame in 2012. Recognition hard-earned and well-deserved. 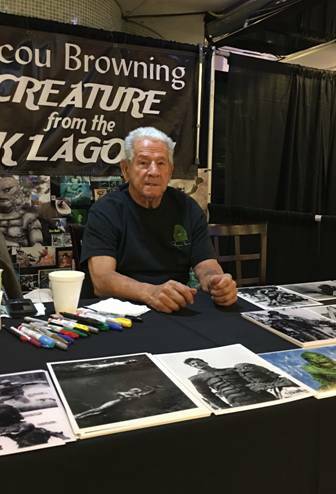 Today, Ricou Browning is still going strong in his native Florida where he maintains contact with fans who love and remember him as the original Creature from the Black Lagoon. We here at Vulcania Submarine are honored by this opportunity to present the highlights of his unparalleled career, and wish him continued success in the future. Thank you for all you've given us, Ricou. You're one of a kind. 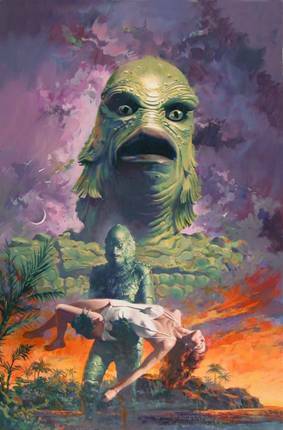 I will close my portion of this page by including this awesome painting from Mr. Browning's personal collection; courtesy of The Creature himself. Image © Ricou Browning, 2017, "All Rights Reserved." Created and Directed SALTY, a full-length feature and television series. 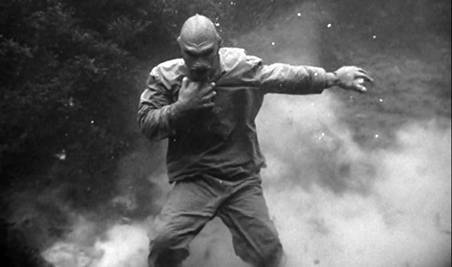 Co-Produced and Co-Directed ISLAND OF THE LOST, a full-length feature film. Academy Award for Special Visual Effects. 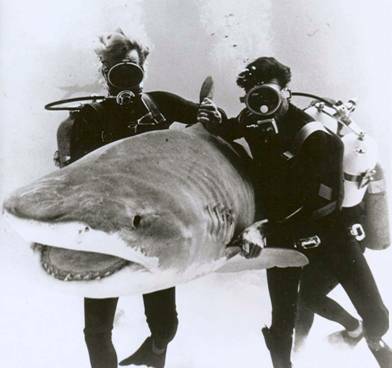 Ricou Browning shark-wrangling a 14-foot Tiger during the filming of THUNDERBALL, 1966. Disney Images © Copyright 1954, Disney, "All Rights Reserved." Browning Family Images © Copyright 2017, Browning, "All Rights Reserved." Web page, et al, © Copyright 2017, Pat Regan, "All Rights Reserved." No part of this Website or Page may be reproduced in any form without the written consent of the Webmaster.